Im currently on my last set of Avery business cards. These have been okay, but Im starting to think that they look somewhat cheap (flimsy paper, not embossed). Maybe this is like "paper or plastic" at the grocery store. I see advantages and disadvantages to both. Pro - Costly, if you change anything on them (phone number,etc.) they look cheap (because you would likely write the change on them in ink pen. Otherwise they look pretty darn good and suggest some stability in the company. Im interested in what others are doing and if they are getting pro, who can they recommend. God knows I am thankful for everyone that suggested Queensboro for clothing. Oh yeah, maybe flame retardant for putting into breaker boxes (oh wait, thats a whole 'nother thread)! $19.95 per thou after that. The money you spend is more than made up in quality. I've used Prints Made Easy for about 3 years now. Full color, both sides, high gloss if you like, inexpensive and very professional w/heavy stock. Glossy high quality picture type cards, I have the front and back printed to make the most of the card. Just ordered a batch and had them in three days for $114. Printing on the back adds about $25 so you can get them a little cheaper. Do not print your own cards it reeks of unprofessional and cheap. Last edited by Scott Patterson; 03-31-2008 at 06:56 AM. Seems those you see that are homemade never have the type centered on the card either. The guy that designed my website, brochures, and cards sent it over via the internet and the prices were cheap and product and service was better than what I was getting locally. I'm surprised that you even asked the question. One of the most important marketing pieces, and usually the first one you give out....should make the best impression. Spend a few bucks and do it right. Delivered in 3 business days. $20.99 per m 1 color delivered. $27.49.per m 2 color delivered. I would also recommend GotPrint GotPrint: Business Card if you want full color. About $47 for 5000 good heavy weight cards, UV coating, etc and you can have the backs printed (color or BW) for only a buck or two more. I've used them a couple of times, had good service and been very pleased with the quality. I don't believe they do the embossed type though, if that's what you want. You still design it yourself, but can make it look any way that you want. I have a photo of a house on the front of mine. Below is what mine looks like (with out the border). The actual cards look much better than this .pdf file. I'm not a salesman for them or anything, but at printsmadeeasy.com you can have any color, multiple colors, photos, clip art, writing, etc. and it is all the same price. Plus the cards are very professional looking. I use Office Depot. They are about $22 per 1000 in one color on decent stock. I am a graphic designer myself as well as a home inspector. I use them for business cards, brochures and postcards for my clients and myself. They're inexpensive, though I'm sure not the cheapest around. But their quality is overall very nice. ANd if you're not happy with something, just call them and they're pretty flexible on either sending new or discounting. If you are looking for images for cards, brochures...I would suggest checking out bigstockphoto.com or dreamstime.com. They have nice images and only cost a few bucks each. Thanks everyone for your response. It looks like you are all very passionate about your vendors. Thats exactly the kind of info I was looking for. Yes, I am a cheapass. I guess I need to get rid of that penny I use to test electrical outlets. And its getting hard to carry my ladder on my bicycle. Also the candles that I use instead of a flashlight are history! Also the candles that I use instead of a flashlight are history! Another vote for overnightprints. Several agents have commented on the quality of my cards. They use thicker paper than other companies I have dealt with. 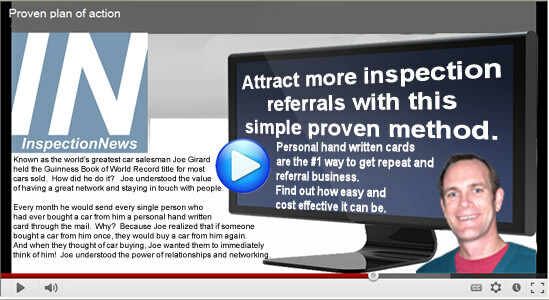 Remember, your cards are the only thing a potential client has to remember you by. I do all my own graphic design work. I'm picky and want things to look just so. It might take a few iterations but I think I've got it down now. I create the PDF file and upload or email it to the printer. The last cards I bought are plastic. Same thickness as a credit card. Clients and agents admire them. That sets mine apart from all the others in the pile. PLUS, they don't melt in your pocket during an inspection. I've been up on a roof and a neighbor drives up and asks if I'm doing and inspection and did I have a card? I was a little embarrassed to toss down the sweat-logged cardboard card. That doesn't happen any more! Not exactly cheap but I've sure wasted a lot more money on non-return advertising. John you must be the cheapest guy on this board. Get Pro biz cards printed, looks so much better and no they don't cost that much. However, during my last business card re-design, which took way too long, I was printing out my own cards for a while. I knew I wanted a new card design but wasn't sure what. I made a few variations of the same card on my Mac and printed them out. I told people, some not all, that I was in a re-design phase and asked for opinions. Eventually I combined elements of a couple of the cards into my current card. For the most part it wasn't an issue. There were a few 'cheap biz card' looks though. Very happy with the job they did and cost. Yes, I am cheap. I cant think of any business I got though because of my card. But, if your serious about your business, you should get pro cards.